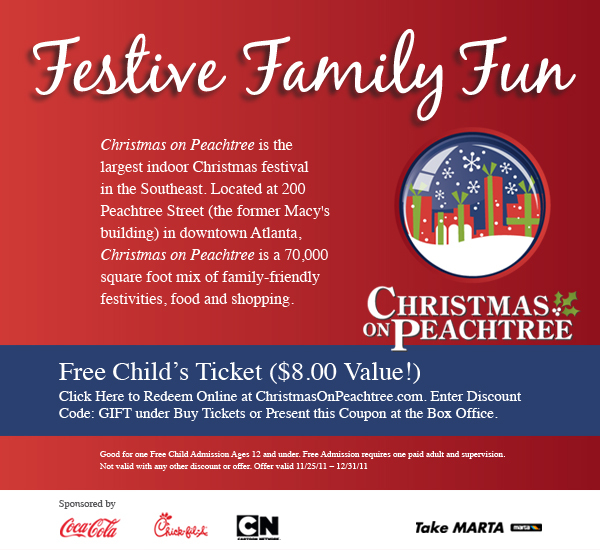 (ATLANTA)—December 2011– 200 Peachtree, Atlanta’s premier new special events space located in the former Macy’s building downtown, is hosting “Christmas on Peachtree,” a blend of holiday must-see activities, events and retail shopping. Christmas on Peachtree is open weekends, Friday through Sunday, and will begin running daily from December 19th until December 29th. 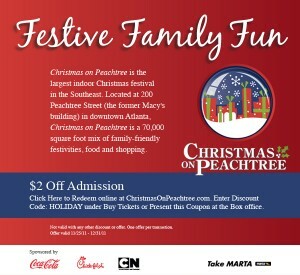 For more details on times and dates visit www.ChristmasOnPeachtree.com for a full calendar. Tickets are $12 for adults and $8 for children. Major sponsors of Christmas on Peachtree include Coca-Cola, Cartoon Network, Chick-fil-A, The Westin Peachtree Plaza, Hyatt Regency and Atlanta Marriott. HERE ARE TWO COUPONS to Join in the Action! Assisting 200 Peachtree in the execution and promotion of Christmas on Peachtree is Entertainment Design Group and Creaxion®. Austell, Ga.-based Entertainment Design Group (EDG) is responsible for the design of Christmas on Peachtree. EDG has worked on productions, events and tours for some of the best-known brands in the world, including The Coca-Cola Company, American Idol, Simon Properties, Macy’s, Best Buy, Bloomingdale’s, Georgia-Pacific and Wal-Mart. Creaxion, based in Atlanta’s historic Old Fourth Ward, oversees marketing and promotions for Christmas on Peachtree. Creaxion has promoted some of Atlanta’s most popular events and attractions including “King Tut,” “Titanic: The Artifact Exhibition,” “Princess Diana,” “Bodies…The Exhibition,” “Planet Shark” and most recently “Dali: The Late Work” at the High Museum of Art. In addition to The Coca-Cola Company, Christmas on Peachtree is supported by The Atlanta Convention and Visitors Bureau and Central Atlanta Progress. Additional marketing partners include Georgia Aquarium, The World of Coke, The Atlanta Symphony Orchestra, The High Museum of Art and Imagine It! The Children’s Museum of Atlanta. I went to this event with 4 other adults, so it probably wasn’t the best idea to go to a children’s event, but I probably still won’t ever take my kids. There were 2 big trees and only 3 vendors, who were selling pecans for $28 a bag and pepper jelly for $15 a jar. You had to pay $7 for a face painting, and a ridiculous amount to get your picture with Santa (no personal photography allowed, of course). The only thing for free was an ornament-making area, but all they provided was paper and markers. They have a pretty cool train for kids, but it only goes in a 10 foot radius and lasts about 5 minutes. All this to say, the $12 to get in wasn’t a COMPLETE waste, because it goes to the Children’s Healthcare of Atlanta charity. However I’d rather give my money and stay home than go through that again.